My annual summer and winter vacations continued with Nariman papa through those years. After my Navar, papa was insistent that I should also go through the Maratab ceremony. After some persuasion, I went through the Maratab in 1985. Meanwhile, papa’s age finally began catching up with him. All those years of hard work and endless cycling between Valsad and Tithal took their toll on him. He began getting increasingly out of breath while cycling up the steep slopes. 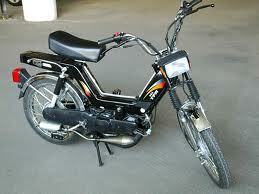 After some discussions, the trusted cycle was given up and papa bought himself a Kinetic Luna moped. He soon got used to it and his daily regimen grew much less exerting. For a couple of years I continued on the cycle and he would ride the Luna. As I got old enough to get my driving license, I would drive the Luna and papa would sit behind. But I must admit that cycling with him was more fun. As age began to catch up with papa, questions also arose in the family regarding the Valsad property. As in many families, there was some disagreement regarding the way forward. Papa himself made his intentions clear, but some members of the family could not accept his decision. What began as a small disagreement soon grew into a full-fledged conflict, and like a malignant cancer, began eating away into the friendship and camaraderie that had existed for so many years. In hindsight, it all seems so petty and inconsequential, but at the time it happened, it was painful. I clearly remember a family meeting held at Tithal on one summer day, with Nariman papa and Dinamai, and their children. Everyone was talking at the same time and nobody was making sense. Nobody was listening to anyone else. My granny was trying to quiet down things and papa looked very upset. That agonizing day, it seemed as though I was not the only child in the bungalow. Nariman papa’s health began to falter. One day, as he was riding the Luna, he fell and hurt himself. There was some loss of mobility. We got him to Mumbai and a CAT scan confirmed that there was a clot in his brain. The children all requested him to give up the Tithal job. After much persuasion, papa bid farewell to the Tithal property and came down to stay with Dinamai in Valsad. Generally, time heals things, but sometimes it just makes things worse. The bitterness within the family increased. The tension grew and like an over-stretched rubber band, something had to snap. In a terrible incident, a young member of our family, unable to stand the tension which had become part of the daily routine, tragically decided to take her own life. Nariman papa was witness to that horrific occurrence. It shook him up greatly and he took a lot of the responsibility for what had happened on himself, even though he was not to blame. Those days in November 1990 were very difficult for our family. It was also the first time when I had to do prayers for someone who had passed away in our own family. It was a terrible experience. On one hand were the raw emotions which threatened to overwhelm everything else. On the other hand, as the priest leading the prayers, it was necessary to maintain decorum and dignity to the proceedings. It was tough, very tough. Even this tragic incident could not heal the wounds of the family. In despair, Nariman papa decided to tear down the old family house and build a smaller bungalow on the same place, leaving a vacant space at the rear for other contesting members. I wonder how he must have felt as the workers began breaking up the old house, carting away the timber beams and that grand wooden door… The family moved to a rented accommodation for the time it took to build the new bungalow. Nariman papa found it difficult to adjust in the small house, after the years of living at Tithal. But he did not complain. He would be up early and after his bath would go the site and supervise the workers, making sure the cement was mixed in the right proportions and the measurements were checked and re-checked. Soon, the bungalow was ready and we all came to Valsad for the house warming. I did the Jashan for the new house, and for some time, everyone sat together and talked. As we returned to Mumbai, a strange coldness entered my heart. I detested the new bungalow and longed for the old house with all its memories. But it had all gone forever…And soon, I would lose the one person who mattered too. Hardly six months after the Jashan, papa got up early in the morning. As he got off the bed, he stumbled and fell down. The clot in the brain had hemorrhaged. He could not move. As my uncle and cousins got up, they saw that papa had fallen down and was bleeding. A doctor was called, but before he could come, it was all over. Nariman papa passed away, in the same manner as he had lived – without any fuss and without burdening anyone else. That train journey to Valsad is a blur. My mind was in turmoil, conflicting thoughts of love, anger, sadness, despondency… all together. As I caught a rickshaw from the station and went through the very roads where we had cycled together so many hundreds of times, many memories came flashing back. As I neared our house I saw that a crowd had already gathered outside. Making my way inside I could hear the murmurs: ‘Marzban aavi gayo, ave e bhanse, ena papa maate…’ It was my granny who met me first. Dinamai hugged me and began crying. ‘Dikra majenu thayu tu aavi gayo. Badhu barabar bhanje tara papa maate…’ I had a bath and changed into my priestly clothes and then saw Nariman papa’s body, placed on the stone slabs, hands crossed and face firmly set. It was a defining moment – a partitioning of time – all that was living and vibrant had now become cold and distant. It was terrible. I sat down and began the slow reading of the Avesta. Behind me, an endless line of people came in to pay their last respects. Parsis, non-Parsis, relatives, friends, vendors, even our watchman from Tithal, all came to say their last goodbyes to Nariman Bawaji. As the hours passed away, the street outside was transformed into a mourning area. The road was closed and chairs put across for the Paidust. At 4 pm, the priests came to conduct the Geh Sarna. I had decided I would not be able to do it myself. As the loud, sonorous voices began the chanting of the Ahunavaiti Gatha, more Parsis gathered. As the priests stopped at the scheduled para, Nariman papa’s body was lifted from the stone slabs and put into the bier. Both my mamas were the Nasseh-salaars that day. I wondered how they felt. So many hundreds of bodies they must have carried in to the Dakhma over all these years. Today, they had to carry in their own father. As the Paidust ended, we all lined up for the Sezda. We filed out and stood in pairs, to begin the long walk from our house to the Dungerwadi, several kilometers away. As my mamas, assisted by other Khandhias lifted the bier, loud wails of sadness erupted from Dinamai and many other ladies. The story which Nariman papa had told me so many years ago, about the difficult feelings he had when he had carried the body of the young lady doctor in Hyderabad came back to me. Those very same feelings were being felt by all of us, as the sons lifted their father’s body and began the brisk walk from Mota Parsiwad to Dungerwadi. We walked, passing through the bazaar and entering the main tower area, where we had shopped together for many years, pass the typing institute, Novelty Bakery, Gajanan Ice-cream… all the places we had visited together. As we went, the chant continued – ‘Nariman ghodagadiwalla… bo saras manas hato…’ We climbed the sleep slope of the Tower, passing through the Dairy, where we had stopped daily for our milk, going on to the garden on the left, then taking the turn to come on to the road leading to the highway. Finally we were on the last stretch, our destination was in sight. We entered the gates of the Dungerwadi and they put down the bier on the stone slab, for the final Sezda. As the crowd gathered around for the final look, many with tears in their eyes, I thought about all the times we had spent together and remembered his words: ‘you can’t take away anything with you. Rich and poor, all will be covered with the same white sheet. But your goodness will live on, much after you have gone.’ They lifted the bier and carried away Nariman papa’s body into the Dakhma. They cleaned the Pavi and placed him there. They loosened the clothes and used the hook to tear long strips of the cloth to enable the birds to do their job. It is very rare for a father to have his sons carry him to the final destination. Nariman papa earned that distinction. They banged the door shut and locked the Dakhma. We recited the Namaskar and performed the Kusti. It was all over. Slowly, we all went back home. The ladies had meanwhile made all the arrangements for the Sarosh no Kardo. After a bath and change of clothes, I sat down to perform the Kardo. As I started praying, the accompanying priest, an old fellow called Behra Sepoy, listened carefully. At a specific place in the prayers we recite the name of the village or town where the ceremony is taking place. As I would recite ‘Mumbai sheherastan’, out of habit, he would gently correct me: ‘Valsad sheherastan’. As the ceremony got over and the visitors departed, we all sat down and began to reminiscence about Nariman papa. Dinamai was inconsolable and would break out in tears every few moments. The Uthamna was held the next day and a large contingent of Parsis and non-Parsis gathered to give respect to Nariman bawaji. We woke up very early, the next morning, for the Padruz and the final moment, when the Ruvan breaks off its shackles and begins its journey towards Chinvat. As we chanted ‘Ruvan Garothmaani baad’ (May this Ruvan attain the House of Songs – Paradise), the Ruvan of Nariman papa arose from the karasya of water where it had rested these three days and began its journey to the place where there is no sickness, no pain, no fights. A place in my heart which had always been there for him, became vacant, never again to be filled by anyone else. 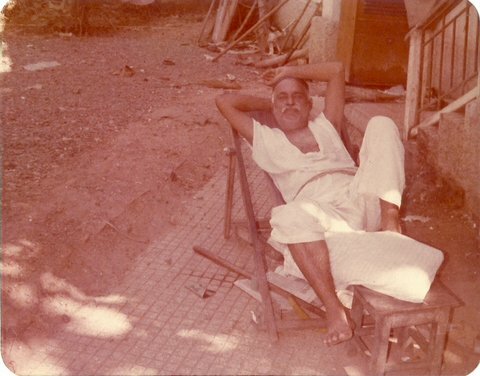 Readers of Frashogard, this is the story of my grandfather, Nariman Vagchhipawalla, a most simple and unremarkable man, who through his simple living, high ideals and sheer hard work and determination left this earth in a much better condition than it was when he was born. It is a story which I have told, with some emotion, to let readers know that greatness does not come through birth, neither through education, nor through riches. Nariman papa had neither high birth, nor education or riches. But his sheer will power and hard work, a never-say-die attitude and the guts to call a spade a spade, made him what he was for all of us in the family – a beacon of hope, a person to love, and a memory to cherish for ever. My granny Dinamai became just another person after Nariman papa passed away. She refused to join us in Mumbai, and stayed at home in Valsad. She disregarded her own health. She would keep quiet and stare vacantly for many hours. Her right palm began to close and she could not open her fingers. As a doctor, my masi realized what was happening. Pretty soon, she was diagnosed with Parkinson’s disease. As the disease progressed, her mental faculties gave up. After some time she could not recognize her own children. 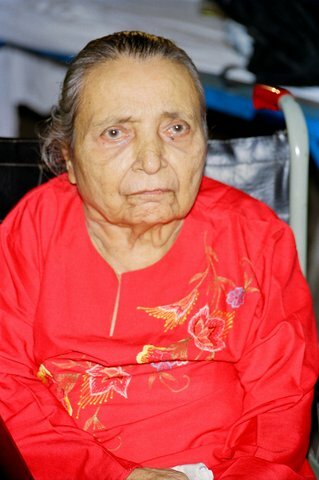 My masi got her to Mumbai and took care of her for many years. I bow down my head in respect for the way in which she took care of Dinamai, attending to her every need, disregarding her own personal life, spending incalculable amounts of money. Dinamai suffered horribly in her last years, but the tender care of my masi ensured that she did not get a single bed sore, or suffer a single fall. She finally left us in Febrauary 2004, twelve years after Nariman papa passed away. I am deeply indebted to my mother and my masi, Dr. Mehru, for supplying so many details of this story, which even I was unaware of. There are many more things which could have been written, but I have left them out. Some were too personal, some would have opened old wounds. But I have been faithful and truthful to the facts. May the Ruvans of Behdin Nariman Behdin Dinshah and Behdin Dinamai Behdin Nariman progress ahead and reach the stage of Anushehi. And may they both guide, protect and bless us all – their children and grandchildren who remember them till this day and forever. Fantastic account. Thank you for sharing this. It is with profound emotion that I read and re-read accounts of your life. May your clan thrive. My Granny Khorshed Taraporewala has left a similar impact on my life, she provided me with unconditional love and the never say die attitude to life, truly as you mentioned their place will always remain vacant, no one else can fill in their place. Thank You for sharing Nariman Papa’s Life, sheer will power and hardwork can get one places and also one needs to love, respect and help out the needy at all times, cause in reality it is their blessings that take one places. May the ravans of Nariman Papa and Dinamai progress ahead and reach the stage of Anushehi. You write so well! You made me feel as if I myself was living each of these moments you narrated. May the ruvans of Behdin Nariman and Behdin Dinamai progress on their spiritual journey and reach Garothman behest. I have myself spent many years living with my grandparents (both paternal and maternal side). Now that generation has passed away and I exactly understand how you must miss them. But thankfully the values they have instilled stay on in us. hope we can pass this on to our future generations. May they continue to shower their blessings on our community. We need it. I have yet to read a more touching and praiseworthy tribute than this acknowledgment of gratitude, respect, love and admiration for the dint of sheer hard work and the the power of the human will your grand papa demonstrated so simply and yet so effectively. May your offspring and descendants also live up to and share their leading light for us to learn, to emulate and benefit from.